This weekend we are heading to Brooklyn for my niece Ashley's wedding. I haven't been to Brooklyn in years, and our girls have never been there. So, not only are we super excited about the wedding, but we are also excited to spend some time in a place we haven't been in a while. Although our time there is limited, we are hoping to check out as many new places as we can squeeze in. As a result, this week's Weekend Dispatch is somewhat abbreviated. My niece is getting married at the Brooklyn Botanic Garden. I am certain the backdrop for her ceremony will be nothing short of spectacular. While we won't be touring the gardens as typical tourists, I'm sure what we will experience as wedding guests will be phenomenal. The venues for weddings look amazing, so stay tuned for some Insta-worthy pics. Harper and I are hoping to get up early on Saturday morning to walk the Brooklyn Bridge over to Manhattan and back. The length is slightly more than a mile, and the views of the NYC skyline are unbeatable. If you're not interested in walking the bridge, you can enjoy views of the city and other activities Brooklyn Bridge Park. I'm never one to pass up a Nancy Meyers film. I watch The Holiday all year long. Something's Gotta Give is one of my all-time favorite movies. And, ahem, Parent Trap, anyone? Tomorrow the film she co-produced with her daughter, Home Again, will be in theaters. Although I won't be able to take in the movie over the weekend, I plan to hit the theater first thing Monday or Tuesday morning to see it. Reese Witherspoons stars as a recently separated woman in her 40s who starts a new life in Los Angeles with her two daughters. Things get a little complicated when her mother (played by the legendary Candice Bergen) convinces her to house three handsome and charismatic young men. Pumpkin spice season is here! While this fact totally excites many people, I'm not a fan of the whole pumpkin spice thing. That being said, I do like to indulge in a select few pumpkin spice goodies (no, lattés aren't one of them and neither is any kind of cereal). 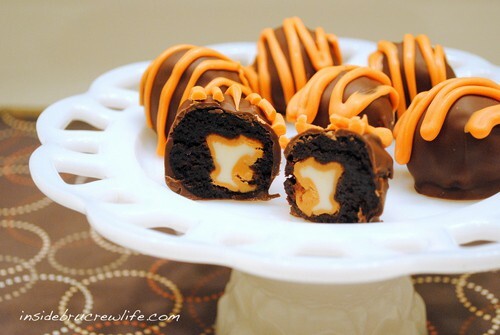 But these pumpkin spice brownie bites look up my alley.